The RP Photonics Buyer's Guide contains 3 suppliers for Lyot filters. A Lyot filter is a kind of optical filter, i.e. an optical device with a wavelength-dependent power transmission. It consists of a sequence of birefringent crystalline plates (e.g. of quartz) and polarizers. In the simplest configuration, the birefringent axis of each crystal is oriented at 45° to the axis direction of the polarizers, and the beam is perpendicular to the plates. The light propagating in a crystal can be considered as containing two different linear polarization components, which experience a different phase delay. The relative phase delay for the two polarization components depends on the wavelength. Therefore, the loss of optical power at the subsequent polarizer is wavelength-dependent. Figure 1: A Lyot filter, consisting of a sequence of birefringent crystals (BC) and polarizers (P). For a device with a single birefringent crystal, the power transmission versus optical frequency can be described with an approximately sinusoidal oscillation. (Chromatic dispersion causes some deviation from an exact sinusoidal oscillation.) By combining multiple crystals with different thickness, a sharper filter function can be realized. According to the Lyot design (invented by Bernard Lyot), the thickness of each crystal is half the thickness of the previous one (Figure 1). In this way, a small transmission bandwidth combined with a large period of the transmission peaks (i.e., a large free spectral range) is possible. Figure 2: Transmission function of a Lyot filter containing three quartz plates, with thickness values of 5, 2.5, and 1.25 mm. A Lyot-type filter with electrically tunable transmission peaks can be realized by using Pockels cells or electrically controlled liquid crystals instead of the passive birefringent crystals. It is a kind of tunable optical filter. 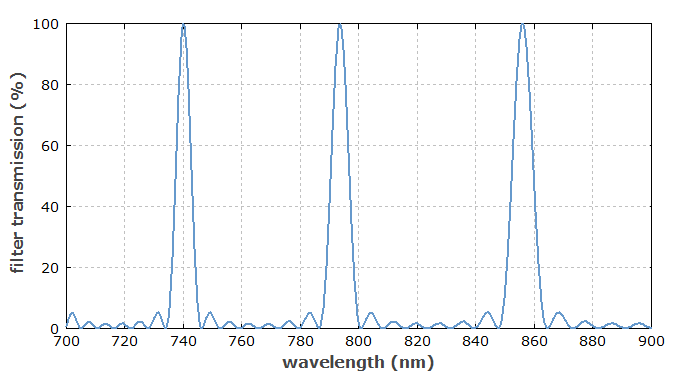 For wavelength tuning of lasers, one mostly uses birefringent tuners based on a similar principle, but not containing polarizers, since the losses via the Fresnel reflection for s-polarized light are sufficiently strong.